Nokia Lumia 900 Release Date Set For March 18th? 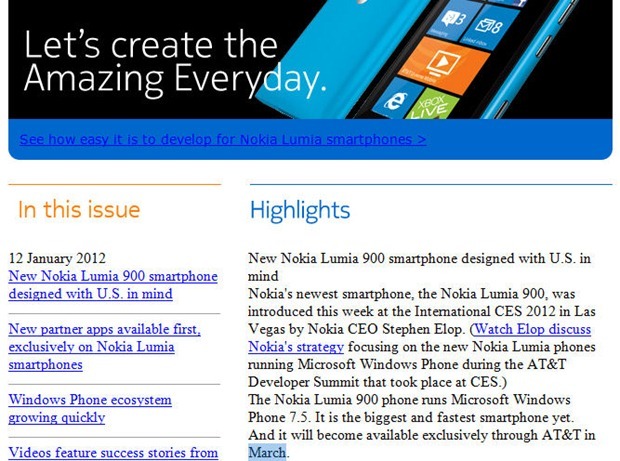 Home > Windows Phone > Nokia Lumia 900 Release Date Set For March 18th? According to a Nokia Developer Newsletter, the Nokia Lumia 900 release date on AT&T is set for March. While at CES this year, we were unable to pin down a release date, getting instead the vague “coming months”. Paul Thurrott has apparently weighed in saying to expect it on March 18th, which would be the third Sunday in March. Sounds feasible to us, but that’s still a long way away and it’s possible the HTC Titan II finds its way to retail shelves before the Lumia 900.